Texas Pump offers a multitude of engine driven pumps for dewatering, transfer for livestock or drainage. The pumps are lightweight, made of corrosion resistant glass reinforced polyester. They come in 2” and 3” suction and discharge, and are capable from 160 to 280 gallons per minute. Most have a 3 or 4 qt. fuel tank, and they offer excellent suction lift, in some cases to 25 feet. Our Pac 160 (shown with yellow fuel tank) is one of our fastest selling engine driven pumps. We also offer frame mounted dewatering pumps, coupled to electric motors. Texas Pump offers a complete fire fighting package for farm and ranch use. Our system will help you extinguish or help control a fire until the fire company arrives. 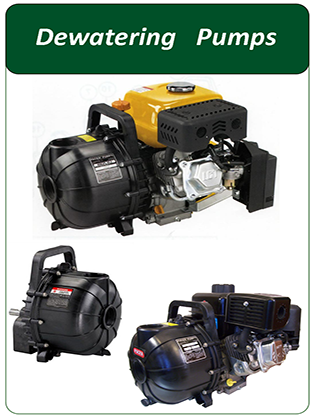 This pump package is ideal for use on buildings, brush and wooded areas. You can use any nearby stream, pond pool or shallow well for a water source. Pump is gas driven and comes with all necessary accessories, including an adjustable spray nozzle and 100 feet of 1-1/2” discharge hose.